Discover how we tackled redesigning an independent school’s website within a very tight timeframe. St Mary’s is a distinguished leading independent school for girls, with students travelling from all over the globe to attend. Upon receiving their enquiry, we were tasked with the complete redesign and development of their web presence – all within just 4 weeks. Using the schools prospectus as inspiration, we used large visuals in a panel style with large white borders as the foundation for the designs. This ensured that what we created was on brand and impactful. Content pages needed to be clear, concise and easy to navigate, so we proposed a simple content template with sidebar navigation to make moving around the site easy for visitors. There’s always something going on at St Mary’s, so a news/blog was a must. 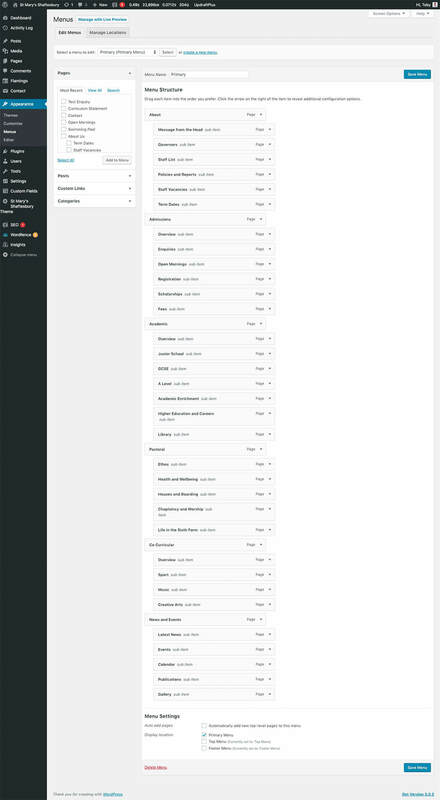 We laid the articles out in a large grid to make browsing easy. The new St Mary’s school website was fully integrated with WordPress so that the school can manage every aspect of content, imagery and modify what pages appear in the website navigation too. We approached Authentic Style with a very specific brief for our updated school website, as well as an extremely tight deadline. The Authentic team were great at listening to and understanding our requirements, developing concepts for the site which were exactly in line with what we had in mind. They were able to quickly adopt a few design changes in the early stages and their efficiency meant they could move swiftly onto the site build. During the build, communication between us and the Authentic team was easy and efficient. We were all extremely pleased with the outcome and, thanks to the training provided by the team, we are now able to easily update and maintain our own site. Staff, students and parents are all delighted with the new St Mary’s site.